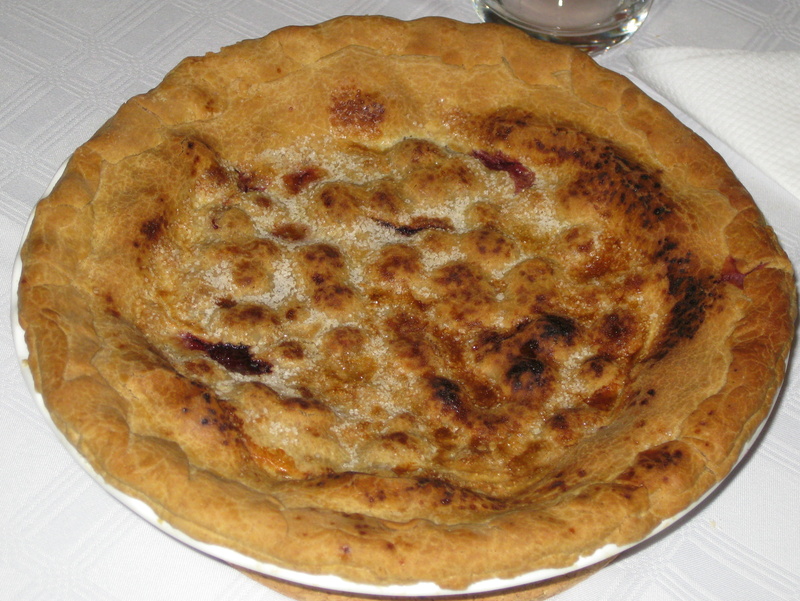 This was the dessert at our pie night from June 2011, and originally came from this blog. I followed the recipe exactly except I used Granny Smith apples (so not exactly, but as exactly as I ever follow one). I also made the pastry in a food processor. I made this a second time with no lard (replacing the lard with butter) and whilst it was delicious it wasn’t as flaky and awesome as the original. Posted by kerribatch in Recipes. This pie was dessert for the Vanilla dinner, and was largely based on a recipe from About.com’s gluten-free cooking pages. 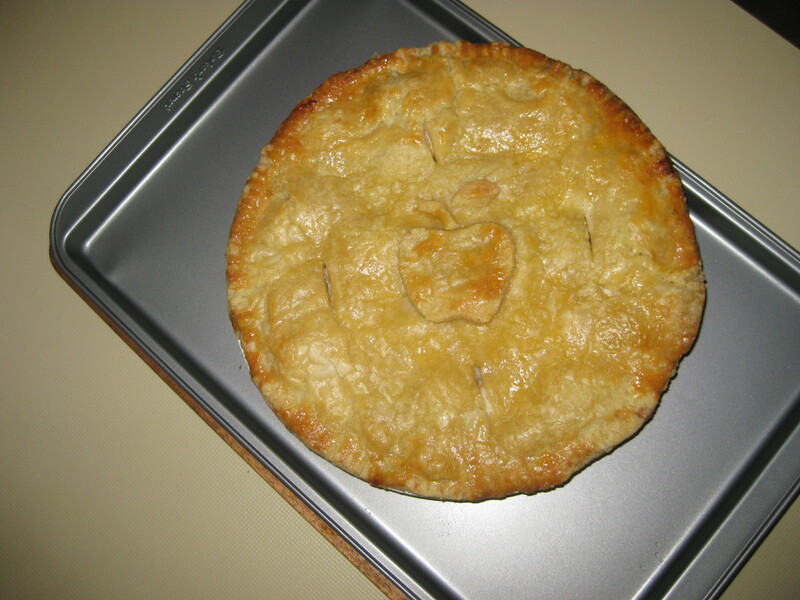 I made one big pie as I didn’t have individual pie plates. It meant I had heaps of leftover pastry. I used a mixture of tinned and frozen cherries because fresh ones weren’t available. It looked like there wasn’t enough filling but seemed full enough (just) after baking. I used vanilla extract instead of almond essence. If I made it again I would try a different pastry wash than milk, as it was quite difficult to put on the delicate pastry without damaging it and didn’t brown as evenly as I would have liked it to. Posted by andrewescott in Recipes. This course from the pie dinner was based largely on a curry recipe from Camellia Panjabi’s 50 Great Curries of India. 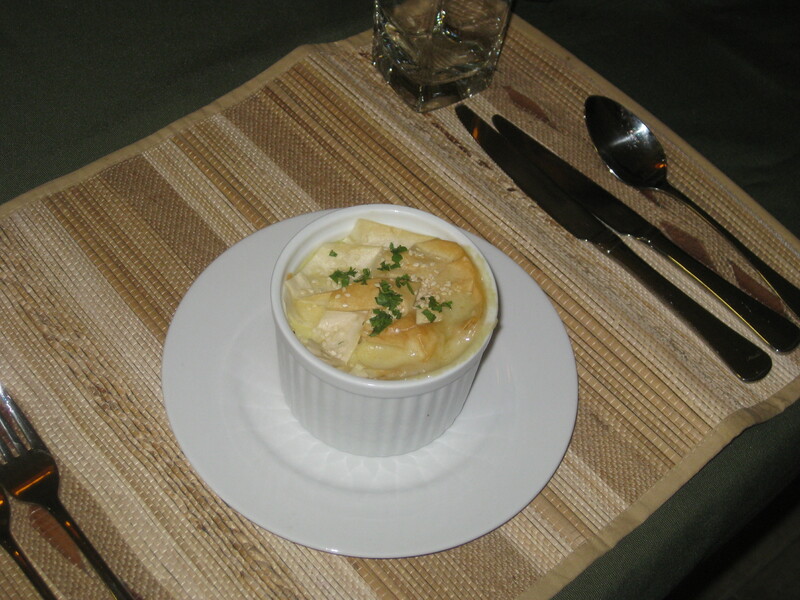 It is a rather liquid curry, so to make it into a pie, a fair quantity of rice was prepared in the rice cooker, and a couple of spoonfuls of rice was placed in the bottom of each ramekin, followed by curry, followed by more rice, and then topped with puff pastry embedded with a sprinkling of caraway seeds. Grind the whole cardamoms in a spice grinder until they become a fine powder. Add pepper to this, plus a little water to make a paste, and set aside. Finely chop the tomatoes, and set these aside. Also, chop the lamb into cubes, to get them ready. Heat the oil in a large pot over low heat, then fry the spice paste for 2-3 minutes. Add the meat, tumeric, chilli and coriander powders, and gently brown the meat for a full 10 minutes. Keep heat low and stir frequently to prevent spices from burning. Add some water if necessary. Add yoghurt, tomatoes and salt to taste and continue to cook for a further 5 minutes. Add 1-2 cups of water, cover, and reduce to a very low heat, leaving the pot to simmer until the meat is tender. But keep an eye on it to avoid boiling over. 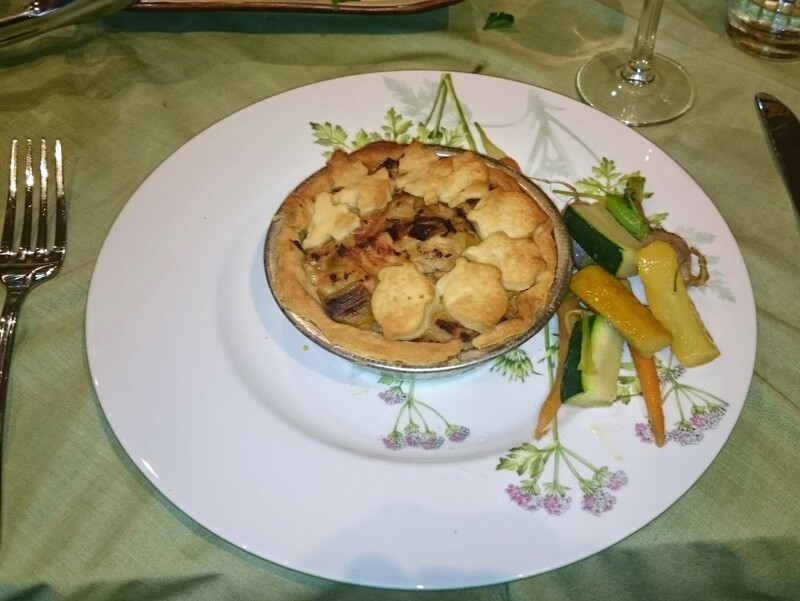 On Monday 6th June, as the wintry cold weather set in, Andrew hosted the Pie dinner. Franca produced a lovely chicken and leak pie to start us off. 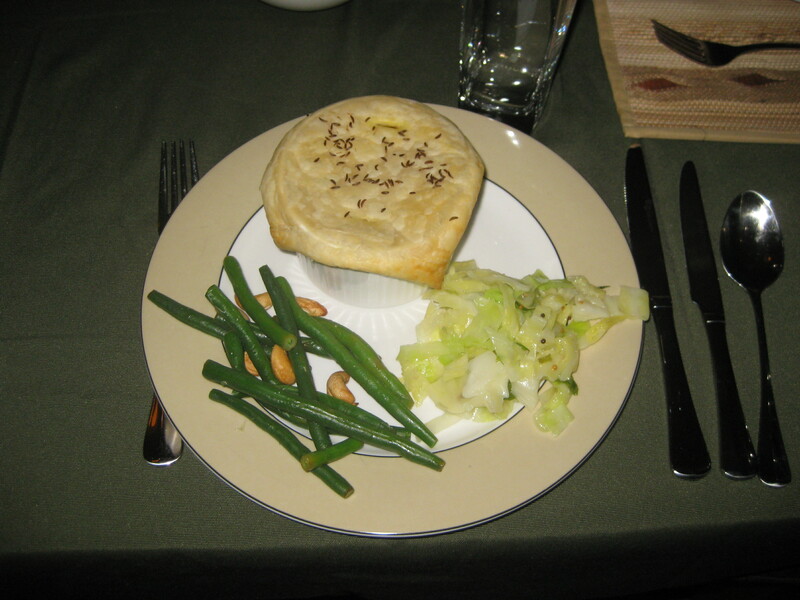 For main course, Andrew served up a cardamom curry pie with sides of fried cabbage and beans with cashews. 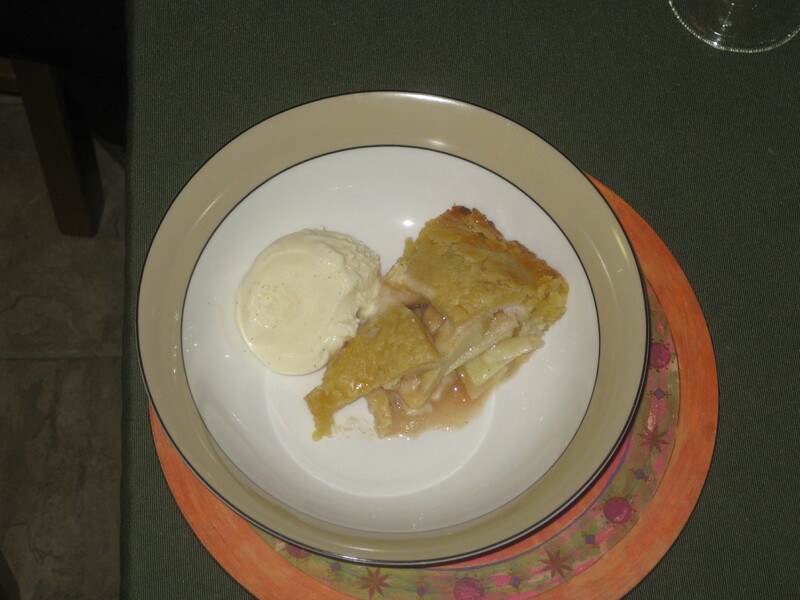 Lastly, Jacinta provided us with a traditional apple pie (with gruyere cheese in the pastry). This dessert is from the Thanksgiving meal. Make the crust following this Pâte Brisée pastry recipe. 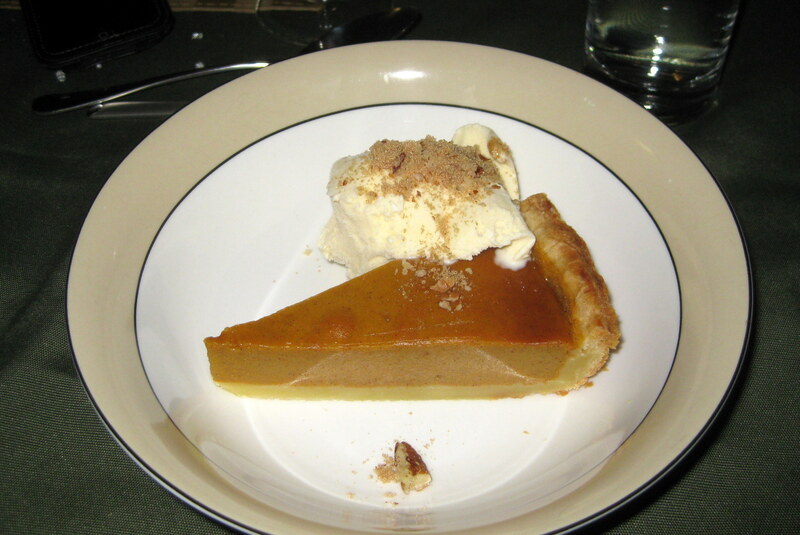 Make the filling following this maple pumpkin pie recipe. The lattice wasn’t made, but a fancy maple-leaf-shaped piece of pastry decorated the top. It was served with vanilla icecream, sprinkled with brown sugar mixed with crushed pecans.